Joyce Chepkirui is a Kenyan long-distance runner who professionally competes at worldwide road running events. She established herself as a half marathon runner and winning races in Granollers, Bogotá and Gothenburg. She set a best of 1:06:19 hours to win the 2014 Prague Half Marathon. She also competes in 10K road races and her personal best of 30:38 minutes makes her the fifth fastest woman ever. She began competing in cross country running in 2012 and won the Kenyan and African titles. Joyce also competes on the track over 1500 metres and was the silver medallist at the 2011 All-Africa Games. In 2014 she won her first marathon in Honolulu and recently her second one in Amsterdam. Dag van de Vrouwen got the opportunity to interview Joyce Chepkirui and her husband Erick Kibet who is a professional runner as well. You have won the TCS Amsterdam Marathon 2015 for women, what crossed your mind when you saw the finish line? Joyce: I thanked God and I felt that I became a real marathoner. We understand your favorite long run is 30 km, did you experience a marathon wall in Amsterdam? Joyce: I didn't have fueling issues this time. There was more in reserves, but as it was cold, wet and slippery, I didn't want to risk. At the Sportisimo Praque Half Marathon 2014 you were pacemaker for Joyce, what made you feel confident she would win this race? Erick: Training was fantastic in Kenya in preparation for Prague. We knew that the course is very good and thinking now, if we didn't go under 31 minutes for first 10km, we would probably have a chance for even faster half marathon time, faster than 66 minutes. Being coaching partner of Joyce, how do you keep her eager to run long distances? Erick: It is quite simple - Team work, hard work, working for the dreams. You have hit a personal record in Amsterdam with 2.24.11, what do you need to hit the mark of 2.21.08? Joyce: Time is needed for better time. And more racing opportunities. I believe that I would run under 2:22:15 if we had perfect day in Amsterdam this year. Some good 10K / half marathon athletes adjust to marathon quickly, some need more time, some simply never succeed in getting to the level they have reached over 10K / half marathon. It seems you transcend at races with highly humid conditions, Are those conditions conducting an ideal energy balance? Joyce: I never thought about this, but now that I gave this a thought, you are right. Not sure what to make of this observation and let's see if this remains as a constant. Do you have an optimal technical and strength training strategy, or will there be room for improvement? Erick: We have reduced gym-work now that Joyce has transitioned to marathon. She does some injury prevention work, but we did cut back on heavier weights when compared to 10K / half marathon days. What rules do you uphold to subside systemic stress after a long run race? Erick: We love our sport and sometimes we jog day after the race, talk, spend more time with friends and try to relax. And we also take several weeks off after marathons. You are married, being husband and wife. How did you meet each other and what made you decide to become partners for life? Joyce & Erick: We met through running more than 10 years ago. It was a love on first sight and we continue to grow together as individuals and as a couple. What is your favorite food; ugali, chappati or sukumawiki? Can you also explain why? Joyce & Erick: Joyce makes some of best chappati there is! Her chappati with carrots is fantastic - sweet, with a touch of salt. For us, the more natural the foods are, the better. Simple, local, healthy. When you visit our country, have you ever tried Boerenkool or a kroket? Joyce & Erick: We have never visited the Netherlands during vacation or off-season, hence we were not trying new foods, as we don't experiment before/ immediately after competition. Have you been to the Keukenhof or other famous places in our country? Joyce & Erick: Unfortunately not, as before the race it is about race and after the race we usually fly home immediately the following day. However, we are planning to spend vacation in Europe in 2016 and spending several days in Amsterdam is scheduled, especially as adidas, who is our sponsor, has HQ in Amsterdam. Where do you draw your inspiration from that makes you a successful runner? Joyce: I love to compete and run as fast as I can. It is road, time and me. What’s your goal for the Olympics 2016 in Rio? Joyce: To run Olympic marathon, represent Kenya and be on the podium. What is your ultimate aspiration in terms of running races worldwide? Joyce: Through my running I want to feel accomplished and use the opportunity to change lives of my family and the community. You have a farming business in Kenia, Do you have plans to expand this business after your professional running careers, or do you want to fulfill another role in the running industry? Joyce & Erick: We enjoy animals - cows, chickens, turkeys, sheep, rabbits and we are planning to invest in real estate and house visiting recreational and professional runners from various countries and do a bit more farming, while having balance of work and enjoyment. Can you give us some tips for recreational running long distances? 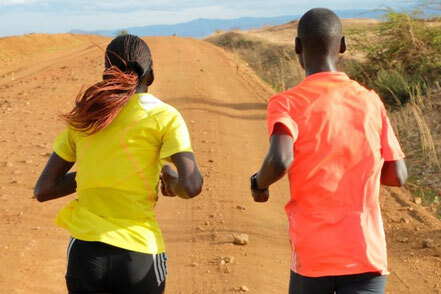 Joyce & Erick: We believe in listening to how body and mind respond to training and we also believe in training with other runners, with some of them being faster and stronger than one is, as that will help the growth. Do you have a Kenyan saying that you live your life by? Joyce & Erick: We live life by God - Father, Son and the Holy Spirit.